Susie Keane's Puppeteens was an educational toy business created by Walter Stanley Keane and his wife Barbara, named after their multilingual daughter Susan. Inspired in 1948, while living in Paris, the Keanes were amazed by the ease with which children could pick up new languages. French was the international language at that time. From 1949, Susan watched her parents create these puppets, in the ballroom of their Berkeley mansion "Elmwood House". The architect for this historic home was the esteemed Julia Morgan, who designed Hearst Castle. 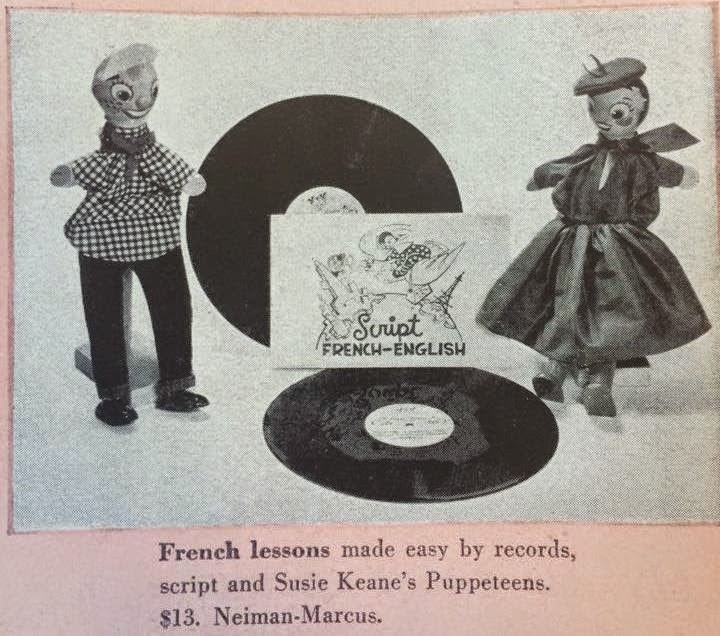 The hand made puppets were typically packaged in pairs, accompanied by a phonograph record and book, oriented towards teaching French to English speaking children. Contained within an ornately illustrated box, the set sold for $13 at high end department and toy stores such as Neiman Marcus, Saks Fifth Avenue, I Magnin and FAO Schwarts, in San Francisco, New York and London, as seen in this 1951 edition of UK's House & Garden magazine. Puppets could also be purchased individually. These puppets were hand painted by Walter, and in part, mark the origins of his "big eyes" concept which later developed into a highly successful empire, inspiring countless artists to follow in his style for generations. The clothing was designed and sewn by Barbara, who later went on to become head of the Department of Dress Design at UC Berkeley in California. The namesake was intended as a business to be developed and gifted to Susan, who grew up to be an accomplished fine oil painter.